'One Day, One Story' the annual storytelling campaign of Pratham Books that celebrates International Literacy Day is back! And like the past few years, PNLIT is a part of this program. 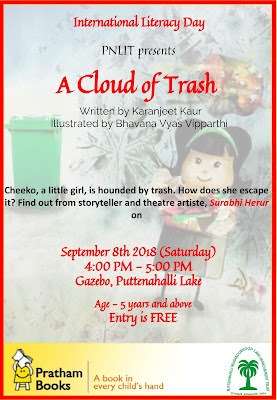 This year's chosen book is A Cloud of Trash (written by Karanjeet Kaur, and illustrated by Bhavana Vyas Vipparthi). 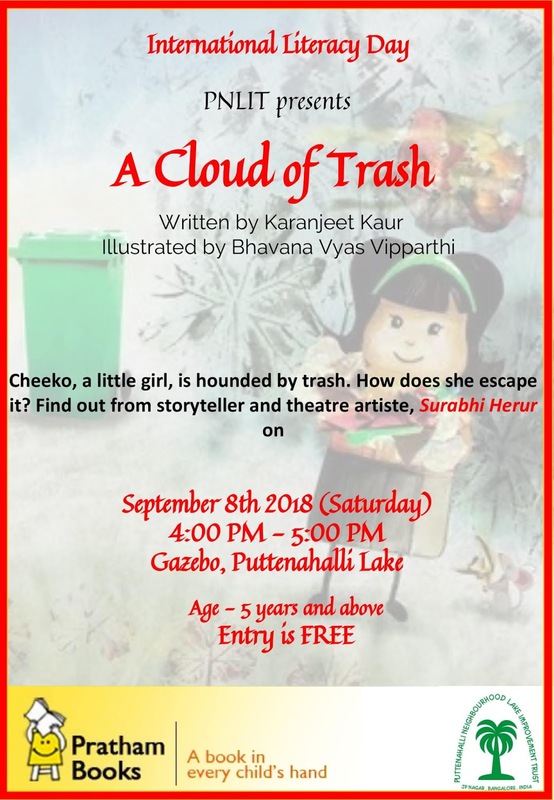 It’s a story about a little girl called Cheekoo, who has a cloud of trash hanging over her head. This makes her very, very unhappy. Slowly she realizes what she needs to do to get rid of this trash! 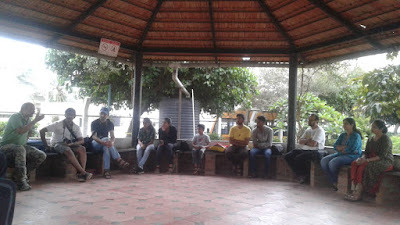 Join in an interactive storytelling session by Surabhi Herur to follow Cheekoo's story. 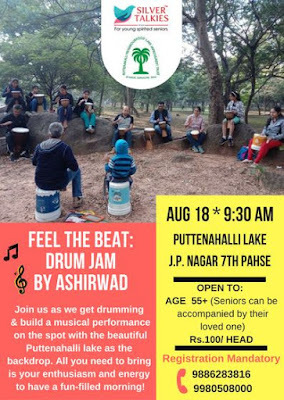 Date & Time - September 8th (Saturday) 4:00 p.m. - 5:00 p.m.
Kindly assemble by 3:45 p.m.
Surabhi Jyotirmayee Herur is a theatre practitioner, filmmaker, facilitator and acting coach. With over fifty projects in drama and film, including hundreds of theatrical shows and many critically acclaimed performances to her credit, her expertise in the field comes from a keen observation of human behaviour and the diversity of experience that a career spanning the gamut of various forms of art and literature brings. Looking forward to seeing you at the lake. 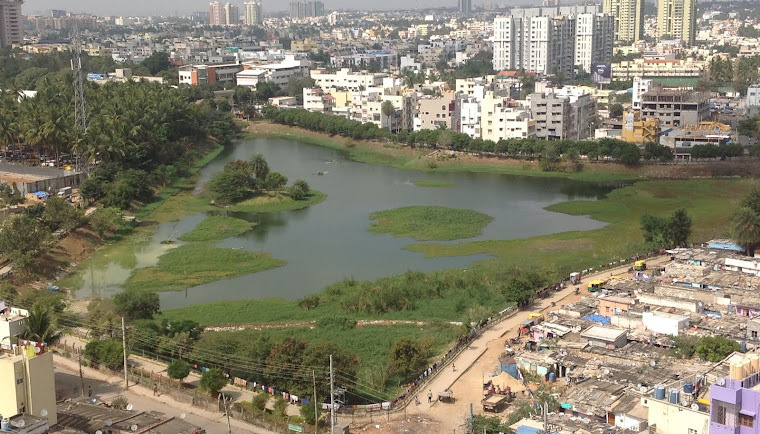 It was a beautiful Sunday morning at the ever so beautiful Puttenahalli lake. Mr. Srinivas Krishnamachari, the mentor was at the venue before time to share his knowledge and experience with the enthusiastic bunch of budding photographers. Every year, 19th August is observed as World Photography day and what could be a more suitable day to conduct a Photography workshop? 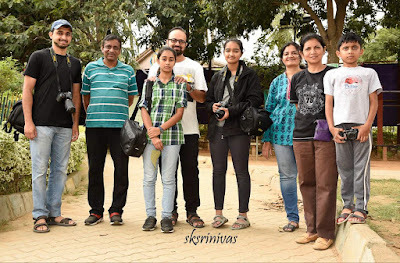 Srini, as he is fondly called, started off with a brief history of photography and why World photography day is observed on 19th August every year. Louis Daguerre and Joseph Nicephore Niepce from France developed a process for getting an image printed on a medium in 1837. 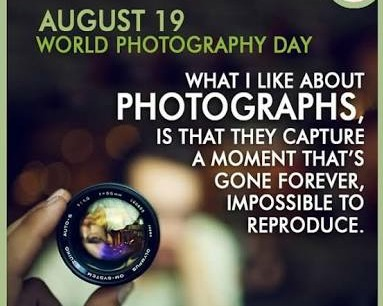 The French government bought their patent and gifted it to the world on 19th August 1839 and hence observed as World Photography day. Srini explained the key technical parameters to get a perfect image, viz., ISO, shutter speed and aperture apart from lighting. He spoke about various types of lenses, cameras and necessary accessories. 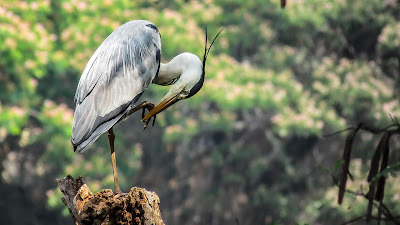 Slowly, the discussion shifted to the main topic of birds and bird photography. 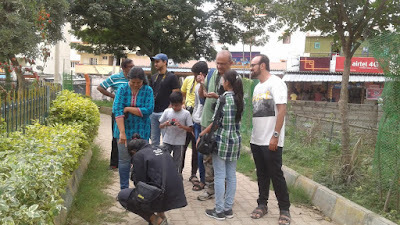 He explained the importance of observing and understanding the bird's behaviour and eating habits for photography. 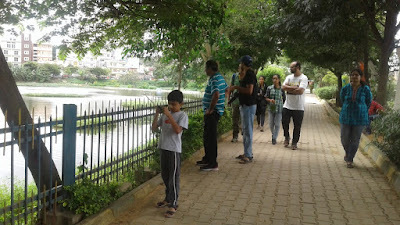 The discussion in the gazebo led to going around the lake to see, observe and click the birds. The cloudy weather was perfect for getting good images of birds. Srini patiently explained various aspects of several species of the birds that were sighted alongwith technical aspects of photography. 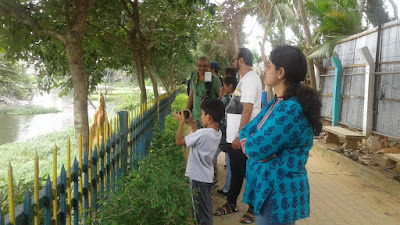 The team was lucky to sight many birds including cormorant, pond heron, grey heron, great cormorant, purple hen and brahminey kite. Turtle, wasps, ants and several other insects were sighted too. 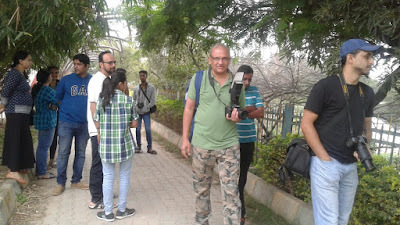 Overall, the three hours seemed short but the attendees went back with a lot more knowledge of bird photography and with a promise from Srini on a full-fledged technical workshop on photography. 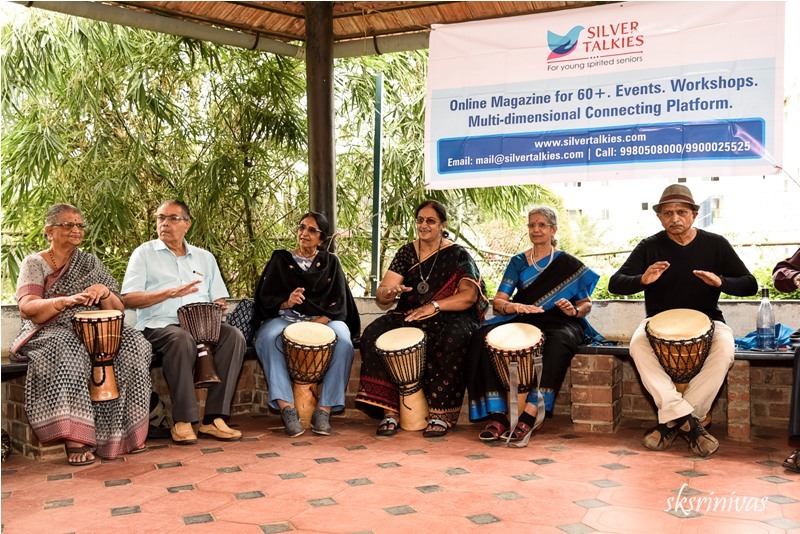 The Drum jam organised by Silver Talkies at the lake on Saturday, 18th August was more than just a group of senior citizens learning the pleasure of a percussion instrument. 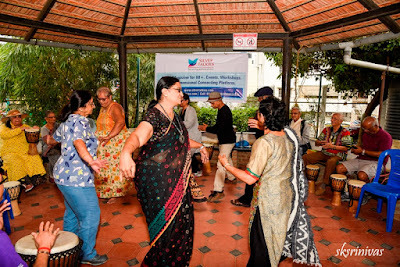 It was also about the spirit and vitality of the young at heart participants. Mr Ashirwad who led the session, invited Mr Padmanabh Arkalgud to blow the bugle and set the ball rolling. He then gave a short introduction to the djembe, a goblet drum from West Africa. While it can produce a large variety of sounds, he stuck to a few easy ones that everyone as beginners could handle. Rather than each of the 21 seniors introducing themselves, he got them to say it through beats on the djembe. Everybody followed each "name" with gusto if not with accuracy. 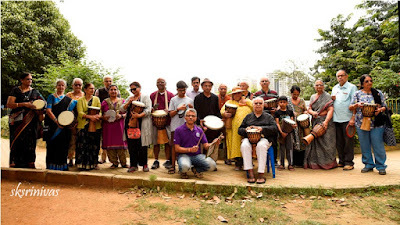 The next round had Mr. Ashirwad's son, Arnav, keeping time on the drums and individuals singing, reciting, even rapping. The octogenarian rapper Mr Arun Bhatia, in fact, stole the show with his snappy lines. With everyone getting lost in the drumming, it was but natural that some, men and women, should take to the floor and let their feet move with the beats. 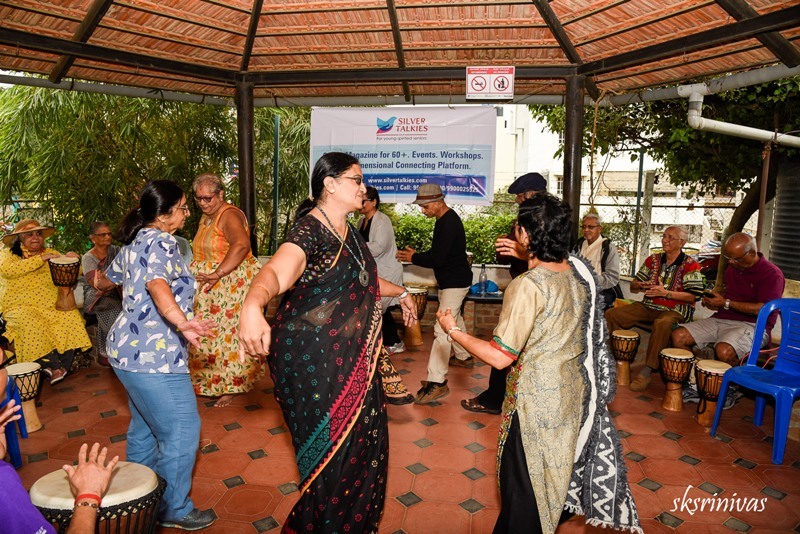 It was a spontaneous, yet graceful garba in the gazebo led by Mrs Harini Dubey, who learned garba in her 40s and won prizes as a dancer. Too soon, unfortunately, the music ended and it was time to wrap up. 19th August is World Photography Day. Birder and photography enthusiast Mr. S.K. Srinivas, who enjoys taking pictures (and he's really good at it!) at Puttenahalli Lake will generously share the fundamentals of birding and bird photography with you. Join him for a photo-walk around Puttenahalli Lake. 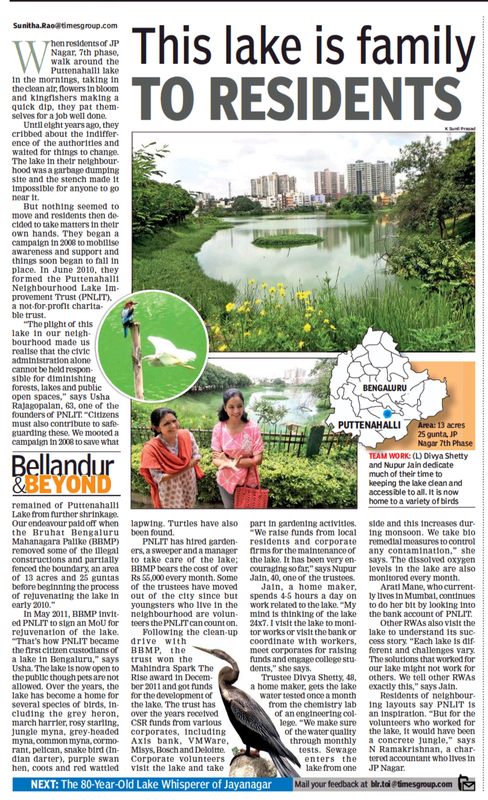 If you have a camera of any kind and are keen to know about birds, then catch up with Srini (and the PNLIT team) on Sunday, 19th August at 8 a.m. (we'll meet at the gazebo, Puttenahalli Lake). It's a FREE event to enjoy photography and nature. Please bring some food and water for yourself. 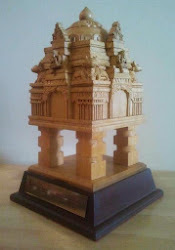 Wear nature-friendly clothing (plain cotton stuff, no bright colours). A hat would be a good idea. And don't forget your camera. 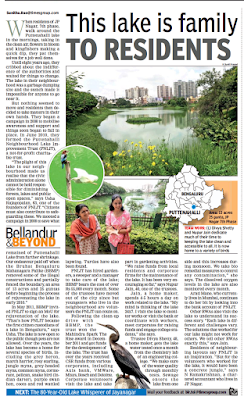 For those who haven't seen today's The Times of India, here is the clipping of the Bellandur & Beyond column (that featured Puttenahalli Lake last week). 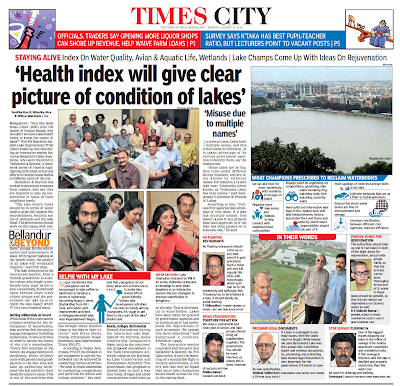 This article is about an interactive session with various people involved with saving and nurturing lakes lake. Our trustees Nupur and Divya who attended the meeting are quoted in the article and seen in the pics.